Reflectors to express your inner Viking. Oh how I long for summer and the midnight sun! Ikea even sells reflective vests. Fluorescent ducks in a row. January 30, 2015. It’s here. The Mørketid. The Dark Time. I’ve been dreading it; when the day is a little less than six hours long, and two of those hours are devoted to murky dawn and dusk. Christmas staved off much of the dreariness with its cheery festivities and candlelight. But now that the holiday is long gone and the snows are heavy, the darkness is beginning to get to me. The problem is, there isn’t much available for local entertainment. After the shopping sprees and stomach-stuffing of Yuletide, Norwegians spend January paying for their sins. Many stores, concert venues, and restaurants are closed for the month or have extremely short hours, since folks go on the “austerity plan” by eating lightly and spending as little as possible. This makes things tough for those of us looking for an indoor distraction from winter. Note the sealskin elf boots with crampons attached, and the layer of gravel embedded in the ice. Outdoor activities come with their own set of hurdles. The light-but-almost-daily snowfalls have compacted into a solid sheet of ice several inches thick on the streets and sidewalks. Farm tractors (the John Deere variety) plow sporadically, but the use of salt is frowned upon for environmental reasons. Instead, roving spreaders intermittently fling out a light layer of granite gravel for traction. Unfortunately, the newest snowfall just buries the gravel, eventually entombing it within the next layer of ice. A true glacier at least eight inches thick has formed in the intersection outside our apartment. As if it’s not hard enough to keep my feet under me, I now have to dodge the spinning and whirling cars as they wipe out in front of our building. Most vehicles have snow treads, and several have metal-studded tires, but these precautions somehow just seem to encourage false confidence. Speeding, plus the fact that our five-way intersection has no stop sign or traffic signal of any kind, makes for a daily carnival of crashes and crazy stunts. I now know why some serious pockmarks scar our building. Check out the reflective threads in my Norwegian hat and scarf. Safety first, kids! Of course, the darkness makes it even tougher for cars to avoid pedestrians. That’s why everyone wears reflectors, including parents, children, dogs, and even the reindeer. I’m not exaggerating — the news yesterday showed herders blinging out their reindeer! I’ve been told that wearing reflectors is actually a law, although this might be just an urban myth. Stylish folks sport sparkling “snapbands” on their wrists and ankles, while others opt for reflective decals depicting Hello Kitty, moose, reindeer, snowflakes, and Viking helmets, which dangle from zippers on coats, purses, and briefcases. 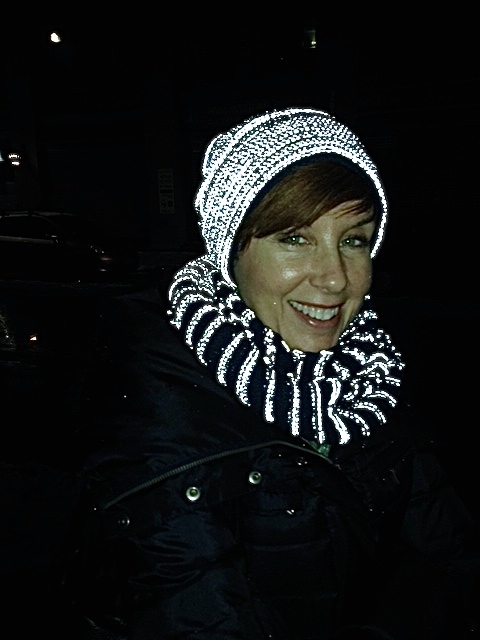 I myself bowed to fashion and bought a Norwegian-made hat and scarf knitted with reflective threads, but fluorescent clothing, especially for runners, is also big. 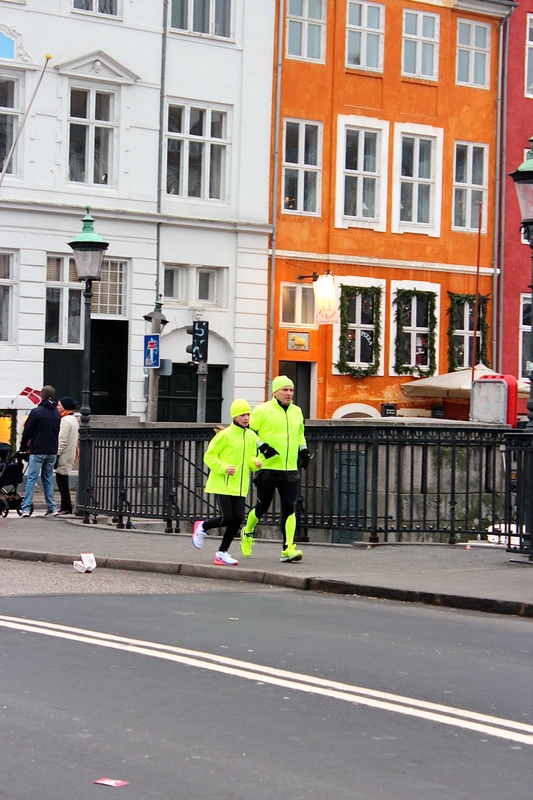 Can’t miss this runner couple in their screaming yellow outfits. Speaking of runners, I’ve seen only a few with cleats built into their running shoes. 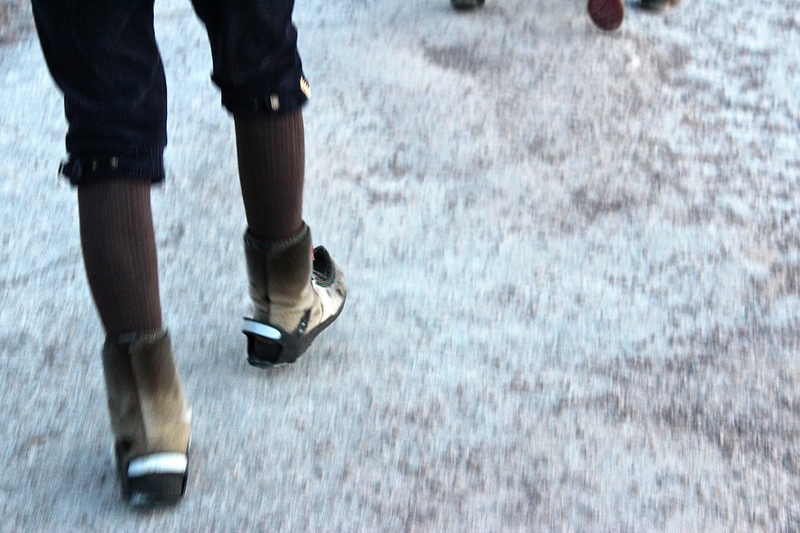 Most folks seem amazingly sure-footed, with no fear of the ice at all. I just don’t understand it; they never slip and slide like Matthew and I do. I ended up buying myself three different pairs of crampons — some for heels, others for flats and snow boots — to manage walking on the slick pavements. The cleats do help somewhat, although they make me feel like an old lady, since most younger Norwegians wouldn’t be caught dead in them. 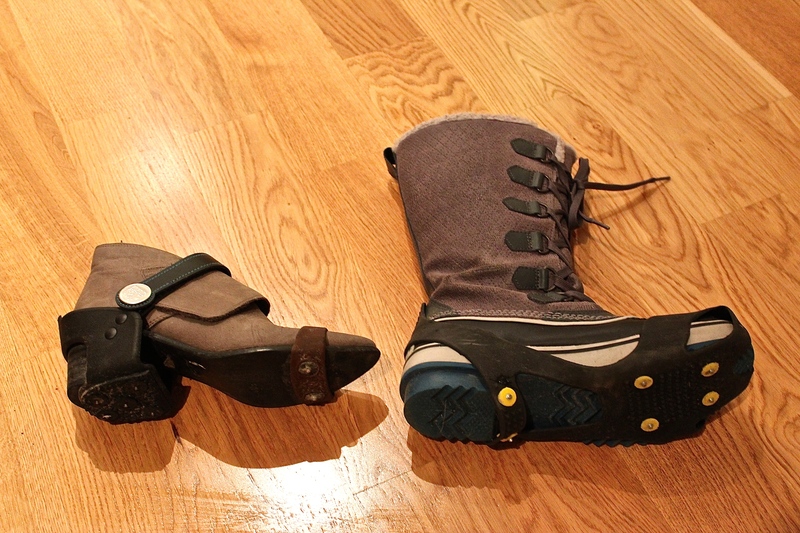 Who knew crampons could be so versatile and fashion-forward? However, despite my best efforts to remain upright, I finally succumbed to the ice. One night, Matthew and I went for another unsuccessful late-night ski practice. We eventually decided walking was safer, so we stowed our skis and took a turn around the Palace park. The crisp, starry night beckoned to me, and with arms spread, I took off at a jog into the snowy meadow for one of my “the hills are alive” musical moments. Three steps into the deceptively powder-coated field, my feet suddenly flew out from under me. Matthew said I looked like a cartoon character being flipped like a flapjack; I hovered three feet above the ground, hung absolutely parallel to the earth for a second, then somehow managed to flip over and land flat on my face. 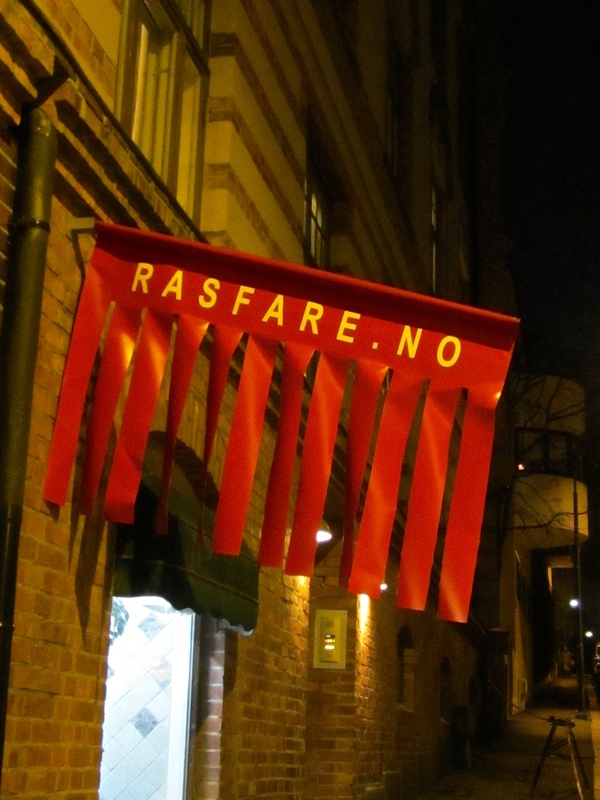 No, it doesn’t mean beware of Rastafarians. It means “Avalanche!” (ice falling from overhead.) As if I don’t have enough to worry about with all the ice on the ground. A bloody nose, busted lip, two black eyes, and some tingling teeth later, I decided that my ardor for the snow had cooled. Several trips to the tannlege (dentist) assured me that I’d keep my smile intact, but she advised that I hold off on the skiing and other winters sports for awhile until my teeth felt more like a part of my mouth. I later found out that I wasn’t the only one who’d suffered. Five people at the U.S. Embassy have broken their arms this year, and the recently immigrated Spanish woman at the corner store said that last year her husband broke his leg on the ice and this year he broke four ribs. Welcome to Norway.